We've got a pretty good handle on the summer of 2013 now. Thought we did earlier, but for some reason started checking average temperatures and realized we had routed ourselves through the desert for 3 weeks during July. Not good with AVERAGE temperatures in the 100's daily. Had to make this in two maps, so we'll go through each of them. An asterisk (*) denotes an Elks Lodge. 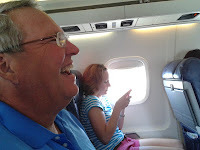 We'll take off from Portland, TX making overnight stops at Kerrville*, Fort Stockton, and Las Cruces* on our way to Albuquerque where we'll spend a month. 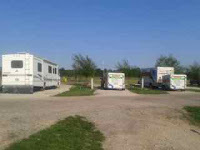 Mid June we'll make an overnight in Raton, NM on our way to Westminster*, Colorado for a month. Mid July, we'll make overnights in Laramie and Rock River Wyoming on our way to Salt Lake City, Utah. Towards the end of August, we'll head to Reno/Sparks, NV with overnight stops in Wells and Winnemucca. As we enter California, we'll have a weeks stay at Roseville* and Carmichael*, we'll pull into Fremont* for 5 nights for this summer's feature event, the Ohio State Buckeyes playing a road game at Cal-Berkeley. After the game at Cal, we'll continue on down the coastline with week long stops at Santa Clara*, Santa Cruz* (only 2 nights), Salinas*, Atascadero*, San Luis Obispo*, Santa Barbara*, Canoga Park*, Downey*, Garden Grove*, Oceanside* and 5 nights at El Cajon*. 10 weeks exploring California! We'll make our way to Yuma, AZ for a week then on to Desert Trails RV Resort in Tucson, AZ for our winter. Hope you'll be along for the virtual ride! 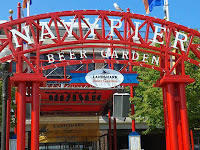 Friday, we had decided if the weather was good, we'd go on a Brew Cruise from Navy Pier. We've sworn off driving into Chicago, when the transit system is so good here. So, we drove to Elgin for our first METRA train ride from there. As much research as you do, you just can't find out everything until you've experienced it. Such was a lot of this trip. We get to Elgin and pass the National Street station, which was the first mistake. I knew the price to park would be $1.50; what I didn't know was cash only and exact change. We had stopped at Jewel Osco on our way and gotten $30 cash (a $20 and two $5's), so off I went to the little market across the street. I was the only one speaking English. Next door was a laundromat, so I broke the $5's into quarters. Then I got the $20 broken into a $10 and two $5's, but not without some language barrier problems. So I pay the $1.50 for the parking in quarters, leaving our $6.50pp for the train ride into town. We knew we were returning from Union Station, so we'd just get tickets there. (This is a key point to remember). Train right on time, beautiful club cars, plenty of space, upper and lower berths. 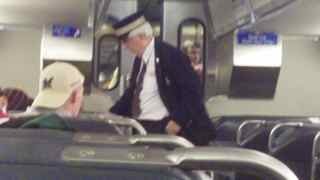 Knew from my reading that we would just pay the conductor, who we saw several times. Never asked us. We get off at Grand/Cicero and we're feeling pretty good about the freebie. Watched others, same thing. Walked across the street to our bus stop and realized we were really, really overdressed. Then the bus was 15 minutes late, and we really, really wanted to get going. Another live and learn mistake. Take the train to Union Station, not Grand/Cicero and get a bus. I have since scrapped the website I was using that gave me that terrific time saving advice. The sites along the bus ride were tough. Lots of poverty. 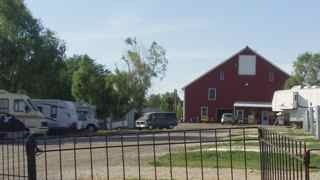 As we were getting closer to town, there was just a definite change of property, rebuilding, and the clientele -- they became mostly tourists like us. 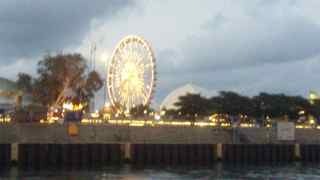 Navy Pier was great. Had a quick dinner at McDonald's then off in search of our Brew Cruise. Thought we'd get a quick beer before we went, then realized we couldn't walk with it. Time to chug. 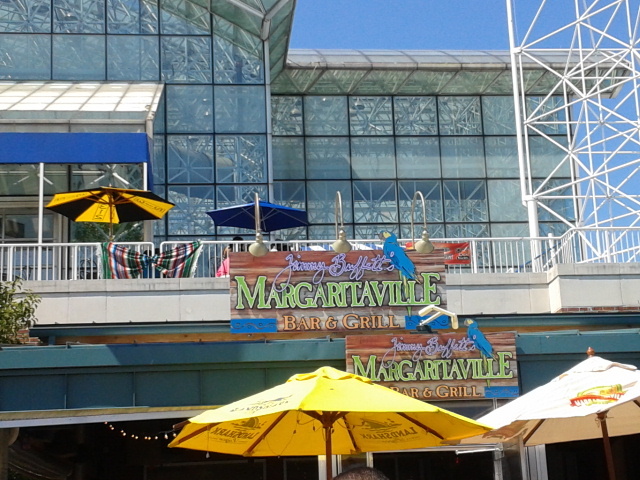 As we got to the pier for our cruise, we realized they had let people preboard and the kegs were open. Didn't have to chug that $5.50 beer after all, should have skipped it. 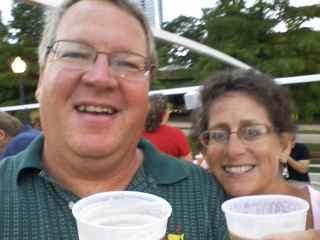 The cruise was 90 minutes, with free beer from Rock Bottom Brewing Company. They featured a white belgian ale, a red ale and an IPA. Preferred the white to all of them. Had some munchies and it was a nice spread. We set sail promptly at 8:15p. You could tell how many people had never been on a boat before. And those that had. Was really surprised that there's a lock at the mouth of the Chicago River/Harbor. Only about a foot each way, but was surprised by that. Captain took us around to the East side of Navy Pier, got us in very nicely for pictures. 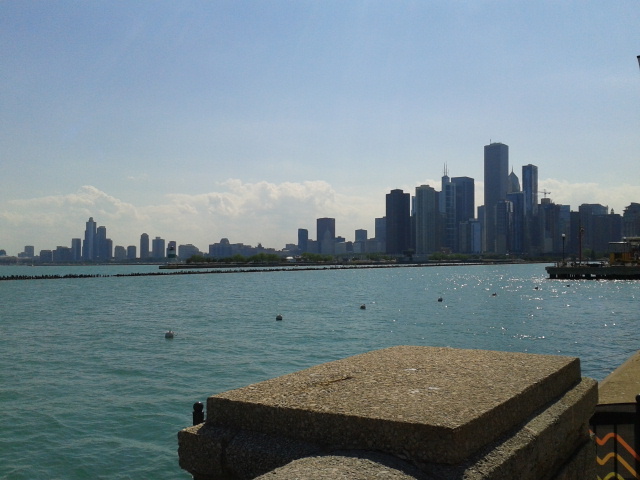 The skyline was beautiful. It really made me wish for a great camera and tripod. Everyone on board was just snapping pics like crazy. It was sensational. 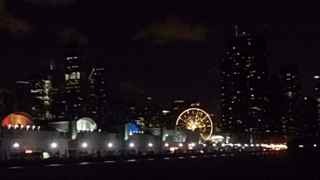 We went to the West side of Navy Pier and still again, breath taking. After returning through the locks, we went into the River a couple of bridges before turning around to the dock. A tremendous experience. We headed back to the Navy Pier bus terminal and got bus #124. My phone had died on the boat, so I was going from memory. Knew if we got on the #124 and headed to Union Station, no problem. Union Station is beautiful inside. The Great Hall is fabulous. However, what we didn't know is that our train was supposed to leave at 10:40p and we were just walking around taking in the sights and probably only had 5 minutes. The vending machines (where we were going to get the tickets, remember?) were sold out of one way tickets. We had to stand in line for tickets and Bob could swear the board said "Now Boarding". We get to our track at 10:44p. Oh well, have to wait an hour. Wait. What? Next train isn't until 12:40a??? Ugh. Walked around Union Station, tried to reconstruct where we made our mistakes, if we got off at the right bus stop, etc. Then we just started looking for what to do for the next 90 minutes or so. Happened on to the Beggar's Pizza place who had a huge neon Coors Light sign on the outside. This will work. Had a couple of beers, talked some Big Ten and golf then headed back for the station. Train was already there and boarding 20 minutes before departure. This time, our conductor was serious old school. Really wanted him to yell "All Aboard!". And no nonsense, since this was about the derilict time of night. Feet off the seats, making sure everyone was awake for each stop, etc. And, he took our tickets. It was a great night, even with all the miscues. We were serious rookies and learned a ton for the next mission into town. Really hasn't been much going on here. Weather has dictated (both good and bad) much of what we've done here at the Sycamore RV Resort. 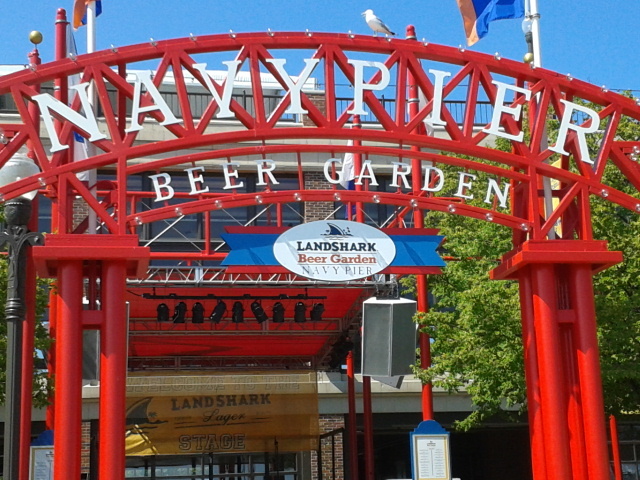 We were going to go into Chicago and see the Dueling Pianos at the Landshark Biergarten at Navy Pier last Thursday. Nope. Going to rain (and it did). Friday, we 'bar hopped' here in Sycamore -- going to the MVP Sports Bar, then to the local Elks. Saturday/Sunday were just beautiful and we sat outside and watched the British Open on TV all morning and afternoon. Monday was a total work day, but really muggy outside so was also an inside day. Today (Tuesday) we were awoken at 5:30 a.m. to 50 mph winds and driving rain (about 1/2") knocking out the power that still hasn't come back on yet. Fortunately, our Honda 2000i is perfect for blackouts, as long as we don't have to turn on the air. Then, it's going to be hot one. 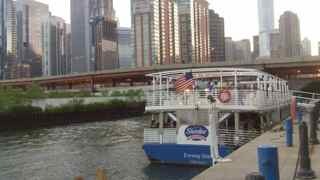 This Friday, we have a Brew Cruise in Lake Michigan, but, of course, the weather will dictate. Since we arrived here at the Sycamore RV Resort, we started thinking their water just plain stunk, but we went through the channels. First, we changed our filter. Still smelled. Then, we noticed it was the HOT water that stunk. Hmm. Friend behind us suggested maybe the anode had gone through. Pulled it out and was amazed at the lime that had attached to it. Usually these are pitted, but this was just covered with lime. And it smelled just like the water had smelled. Flushed that thing out and the lime that came out of there in chunks was amazing. Ran another tank through it and now we'll see if we fixed our problem. We didn't waste much time after getting set up in Sycamore, IL. After arriving on July 5, we took the dogs to the Bed and Biscuit for their vacation the next day. Then, it was time for us to start packing for our quick weekend trip to our hometown - Wilmington, OH. 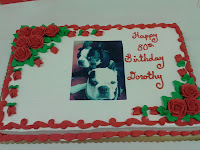 It was Connie's Mom's 80th birthday and we had planned a surprise party for her complete with a surprise visit from us and our daughter and son-in-law. Since the dogs could not make the trip, Dad decided to have them put on the cake. She was surprised and it was great to visit with family and friends. Quick trip, but was fun. The next day, we headed to the airport for our flight back to Chicago. Bonus was that our daughter took some time off to join us for a couple of days. She doesn't do the flying thing very well. And, since we were only flying from Columbus to Chicago, we were on a very small plane. She wasn't too crazy about that. As you can see, we got a chuckle out of it. Her time with us was also going to be short. 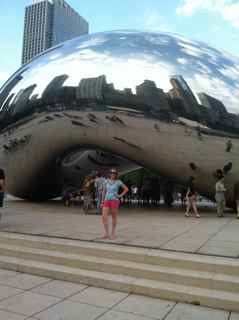 Once we landed (after an hour plus delay), we made our way right to Millennium Park. 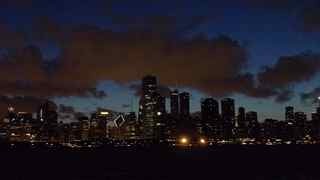 There is so much to do in Chicago. This area is a must see! We only hit a tip of the park. We had to get pictures of the Bean. Of course, all that traveling made us hungry. We went in search of a Chicago style pizza. Just around the corner from the park, we found Giordano's Chicago Famous Stuffed Pizza. The pizzas look just like the photos on the website. They are delicious and very filling. It was getting late, so we boarded the CTA Blue Line back to our truck to head home. Tuesday was spent just relaxing and watching the All-Star Game. Bethany had a late flight on Wednesday, so we headed back to town for some more sightseeing. 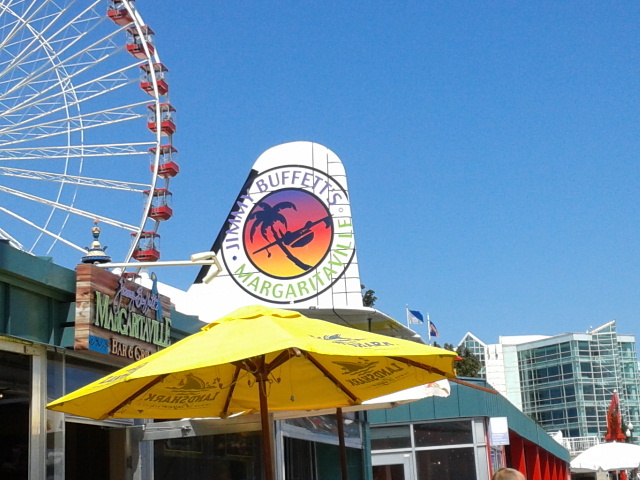 The Navy Pier was on our agenda this time. The weather was perfect. 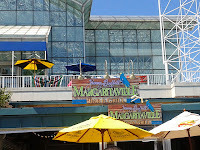 We wandered around a bit before having an early dinner at Jimmy Buffett's Margaritaville Bar & Grill. Then, it was off to the airport to send her back to Ohio. Again, time was short, but was so enjoyable. 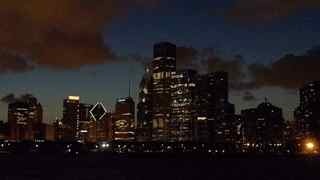 "My kind of town, ...Chicago is..."
Looking forward to the next couple of months here. 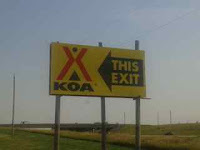 Before we arrived a couple of days early at the Capital City KOA in Topeka, we had planned on one stop over in Des Moines, IA at their Elks Lodge for a couple of nights. Once we shifted our stay in Topeka back a couple of days, we decided to stop two different places on the way to our 3 month summer home in Sycamore, IL. 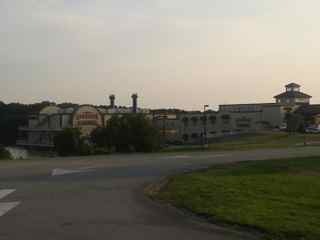 The first was Terrible's Lakeside Casino in Osceola, IA. Only $20/night for full hook ups, we decided to stay two nights. We're not gamblers by any stretch, but we do enjoy a Casino's buffet. The park was only 12 years old, but looks like it was built for rigs of the 60's. There was no support for the big Class A's it needed to hold and many of the pads had either been re poured, or in real need of help. Nevertheless, it was perfect for us until we found out storms had knocked out data towers and our Verizon Mi-Fi wouldn't work. Terrible's had a Nifty Fifty day on Monday where the lunch buffet was two for one (we were pigs) and every hour on the hour they would give away $1,000 in slot play for anyone who was registered and there. Was only a 5 minute walk to the casino, so about 10 till every hour, Bob walked down, waited for the name to be called, walked back. During the 6 o'clock drawing we both went, Connie using her free play for signing up for their card. "Attention, Lakeside Casino Customers. The winner of this hours Nifty Fifty drawing is Robert" <long pause> "Anderson". We could have died. During that long pause, we both were ready to jump up and scream. Nope. Might as well have said "Robert NotYou". Funny story, but both of our hearts skipped a beat. 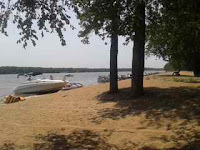 It was still hot as we travelled the on the 3rd to Buffalo Shores, Iowa. 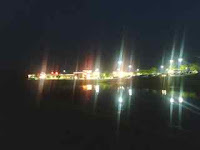 We had been there before, it's really a great place for those with boats to pull up along the shore and stay in their trailers. 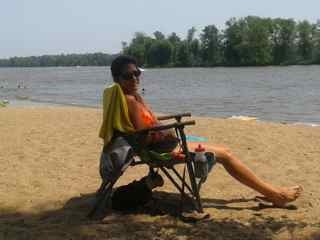 Water of the Mississippi was great as it was still well into the 100's both days we were there. They had changed their alcohol policy to where you could have beer in the water, you could have beer at your trailer -- you just couldn't have beer on the sand. Really bizarre. Was exactly what we wanted, a place to stop, get in the water, cool down, and it was only $18/night. 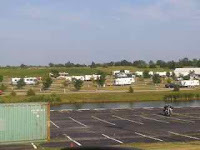 The 5th, we took off early to avoid the heat and made it to our new home for 3 months, Sycamore RV Resort. 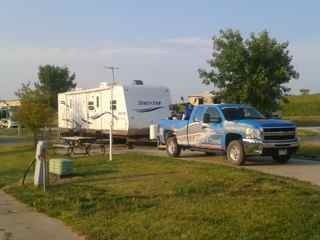 We said goodbye to our friend Cody, as he, his wife and kids brought the U-hauls up from Dallas to their new home in Topeka. We remember well what it was like moving with all of our things in pretty much one place. Only now, all of our things are in one place and they're moving all the time! 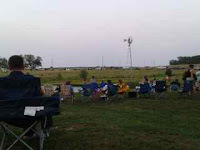 When we checked into the Capital City KOA in Topeka, one of the events was fireworks on June 29th and 30th. Got to the 29th and scratch the "and 30th" part, so we went 'over the hill' and watched the festivities. It was something. Basically, the camp had given one of the locals who sold fireworks in town a place to shoot off his wares to a captive audience. Everyone got a "shoot sheet", and our host introduced each rocket that went off. "That was Spunky Monkey. Next, we're going to do some Sparkling Twirlers. Remember, bring in your shoot sheet for 10% off your order of anything you see here tonight...." It was kind of similar to waiting for the community's fireworks to go off, and you're looking at the neighborhood's personal fireworks display in the meantime. Saturday was the longest packing day ever. It was so blazing hot, we set records the last 5 days we were in Topeka for heat. Awful. But, we got things taken care of and were on the road Sunday (early for us) headed for Iowa. Enjoyed our time there, can't see us spending a month there again. Going to break down our blog posts into a few. We've done so much in the last two weeks, that I'll break those down. There was the last weekend in Topeka. There was the mini vacay to Ohio and bonus bring back the daughter for a couple of days.